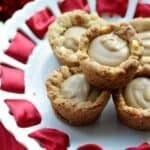 Elvis Inspired Cookie Cups Recipe, an easy holiday and Christmas cookie full of peanut butter, honey, banana, and bacon! 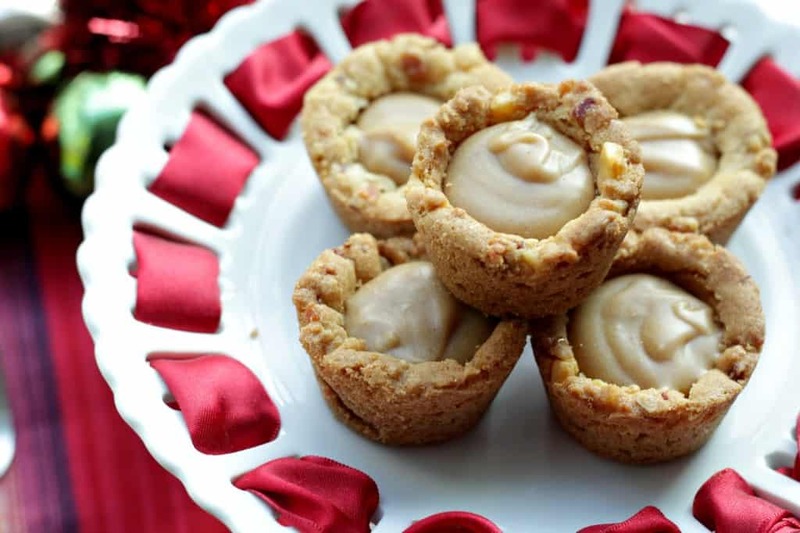 Elvis Inspired Cookie Cups, a cookie recipe full of banana, honey, peanut butter, and bacon! Welcome to cookie #3 of my holiday cookiepalooza! If you’re just joining me, I’ve been taking the dough from my Chocolate Chip Cookie and transforming it into a variety of cookies by adding a few other ingredients to the basic dough. Friday, I posted my Chocolate Turtle Cookies that included melted chocolate, caramel, toasted pecans, and chocolate chips. Yum! I have more recipes coming up this week, but today, you’re in for a real treat!! 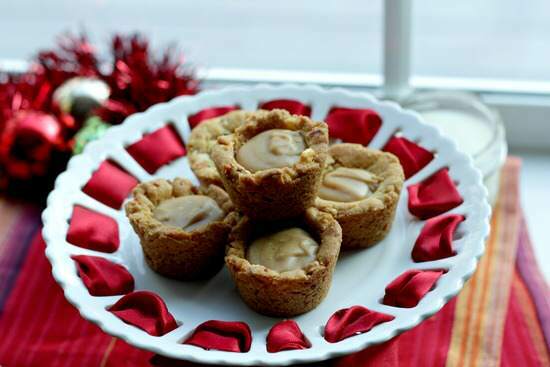 These Elvis Inspired Cookie Cups are also made out of the basic dough and just a few additional ingredients. When I tell people about these Elvis Inspired Cookie Cups, I definitely get some strange looks. BUT, then people try them and they can’t get enough!! They’re full of chopped dried banana chips, crispy bacon (YES BACON! ), peanut butter, and honey!! Don’t let the bacon scare you! Before you think I’ve lost my mind, give them a try! You might remember that I’ve had this strange obsession with “Elvis” inspired foods stemming from his well known sandwich that supposedly included banana, bacon, honey, and peanut butter. First, there was the Elvis burger I had on my trip to the 2011 BlogHer Food Conference Atlanta earlier this year. That one seemed like a good idea at the time, but think I’ll pass on that next time. Then, this past summer there was my homemade Chunky Elvis Ice Cream. The ice cream was definitely a better idea than the burger! Now, we have Elvis Inspired Cookie Cups!! These were definitely a good idea and surpassed my expectations! Be sure to read my post for my Chocolate Chip Cookie recipe I posted last week for a better overview of the dough. To quickly summarize once again, I’m going to use the same basic dough for these Elvis Inspired Cookies that I used for those cookies. I used an unbleached all-purpose flour with 10% protein and weighed the flour. I also do not suggest substituting margarine or anything else besides real butter and I also do not suggest using a whole egg rather than the egg yolks. If you do any substitutions, just know that your results will vary greatly. Baking is a science and if you change one thing, everything else can be off. You can double or multiply the basic dough recipe and make several different kinds of cookies that I have already posted or will be posting this week. Just divide the basic dough between bowls then add your add-ins and other ingredients. Again, I will highly recommend refrigerating the finished cookie dough for a few hours or better yet overnight or up to 2-3 days. You can also make the finished cookie dough, ball it up, and freeze the balls in plastic bags for a few months then take out what you need and bake for fresh cookies anytime!!! For this particular recipe, I’d suggest letting the dough soften a little so you can put the dough in mini-muffin pans or refrigerate the dough right in the pans. 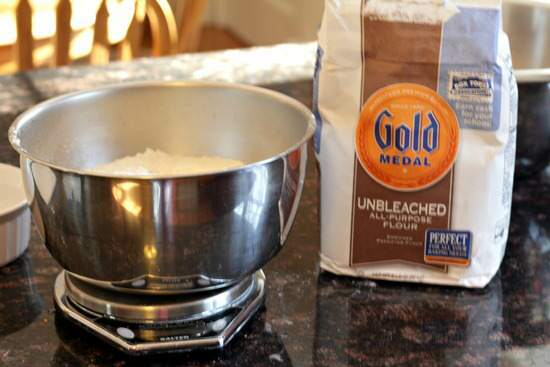 I used Gold Medal unbleached all-purpose flour and weighed it. It has a 10% protein content. You can find good kitchen scales all over. Most stores will carry kitchen scales and they’re definitely a good buy! Whisk all the dry ingredients together and set aside. Mix the sugars, butter, eggs, and vanilla for a few minutes until well combined. The dough is now ready to be turned into these Elvis Inspired Cookies. Add the chopped bacon and banana chips. I would suggest using a good quality bacon, fry (or bake it), let it cool, then chop it up. For the banana chips, I used Mariani Banana Chips. You can usually find the dried banana chips by the other dried fruit/raisins. I like to add my cooked bacon and banana chips to the food processor and pulse a few times to chop everything up but you could chop it all with a sharp knife. Refrigerate the dough for a few hours, overnight, or up to 2-3 days. 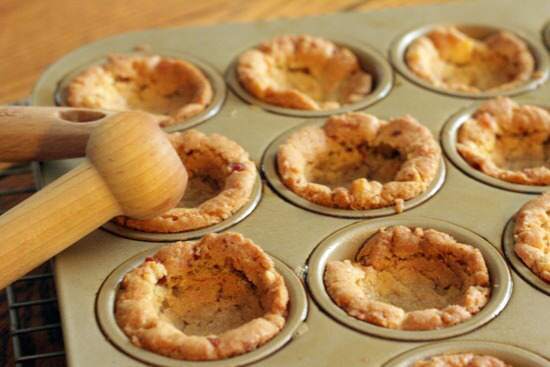 You could also divide the dough among the cups of a mini-muffin pan(s) and refrigerate the dough in the pan. 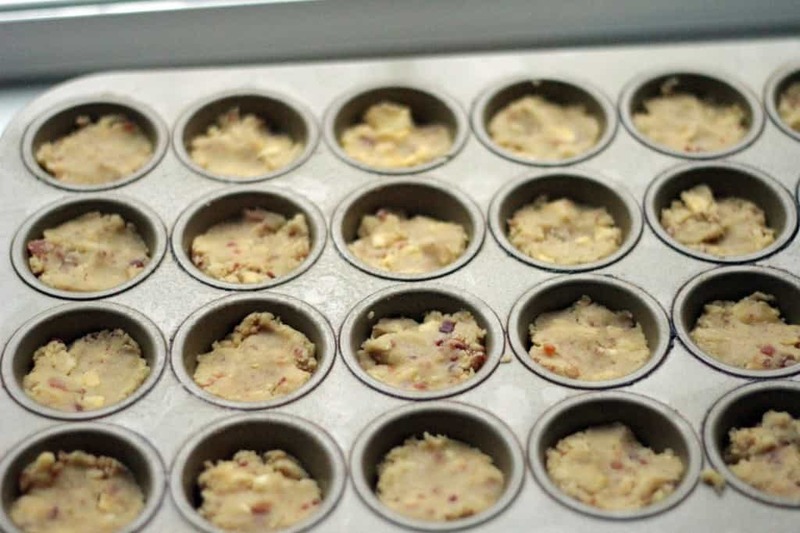 If you didn’t refrigerate the dough in the pan, let the dough soften a little then divide it among mini-muffin cups and press down to cover the bottom of each cup. Bake the cookies at 350 degrees F for about 15-20 minutes. While the cookies are still warm, use the handle of a wooden spoon to create cavities in each cookie. Cool cookies on wire rack. 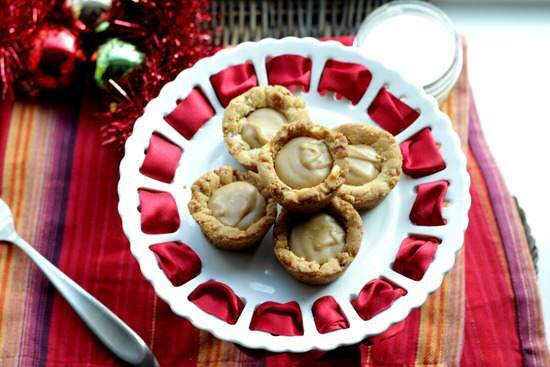 I like to use my Mini-Tart Shaper which makes it easy to form the cookie cups! Drizzle the honey in cavities of each cookie. Then place peanut butter chips, cream, butter, and corn syrup in microwave safe bowl and microwave on high for 30 second intervals, stirring after each interval, until mixture is smooth. 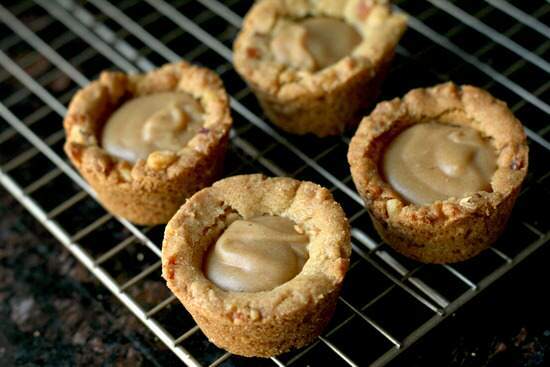 Spoon the peanut butter mixture into each cookie cavity. 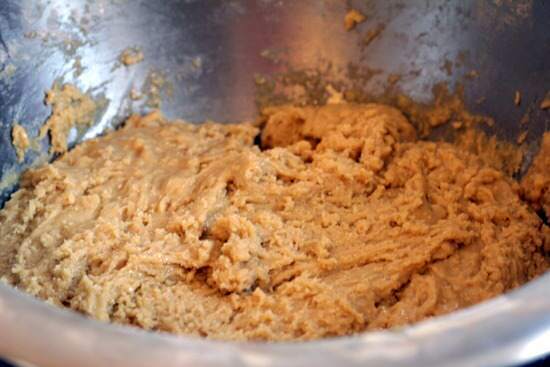 Let the peanut butter mixture cool until it firms up a bit. Put on your favorite Elvis Christmas music, and you’re ready to enjoy! Inspired by the popular Elvis sandwich that included bacon, honey, peanut butter, and banana. 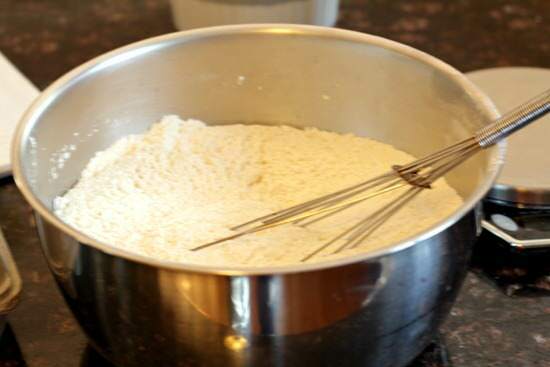 In large bowl, whisk together flour, cornstarch, salt, baking powder, and baking soda until well combined; set aside. 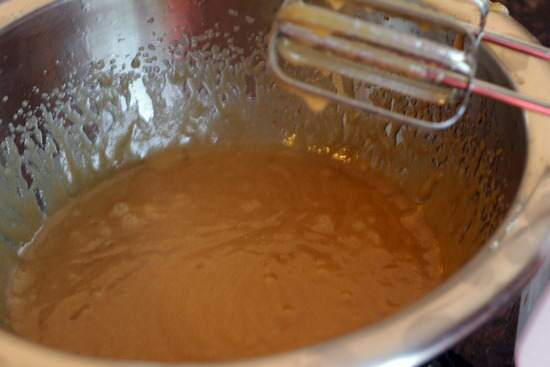 In a separate large bowl, beat together brown sugar, granulated sugar, and 1 cup butter with an electric mixer on medium speed until well combined. Add egg, egg yolks, and vanilla, and beat until well combined. Beat flour mixture into wet mixture until combined. Stir in bacon and banana chips. Cover dough and refrigerate 2-3 hours, or overnight, or up to 2-3 days. Let it sit at room temperature until slightly softened. Preheat oven to 350 degrees F. Divide dough among lightly greased mini-muffin pan cups. Press dough down to cover bottom of cup. Cook about 15-20 minutes or until golden brown. While still warm, use handle of wooden spoon to create cavities in each cookie.Cool cookies on wire rack. Drizzle honey in cavities of each cookie. Meanwhile, place peanut butter chips, cream, 1 tablespoon butter, and corn syrup in microwave safe bowl. Microwave on high for 30 second intervals, stirring after each interval, until mixture is smooth. 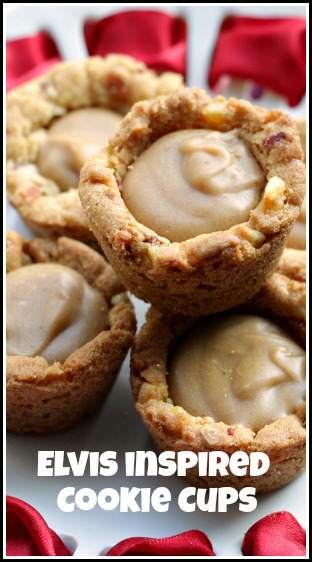 Spoon peanut butter mixture into cavities of each cookie. Cool completely until peanut butter mixture is set. SNAPPY TIPS: I strongly suggest refrigerating the dough for best results and not baking right away. 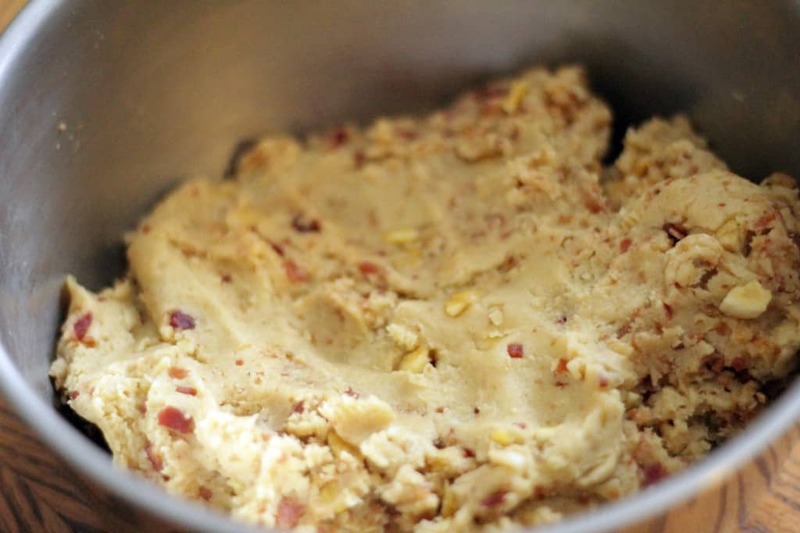 You can make a big batch of the basic dough then use it for other upcoming recipes. 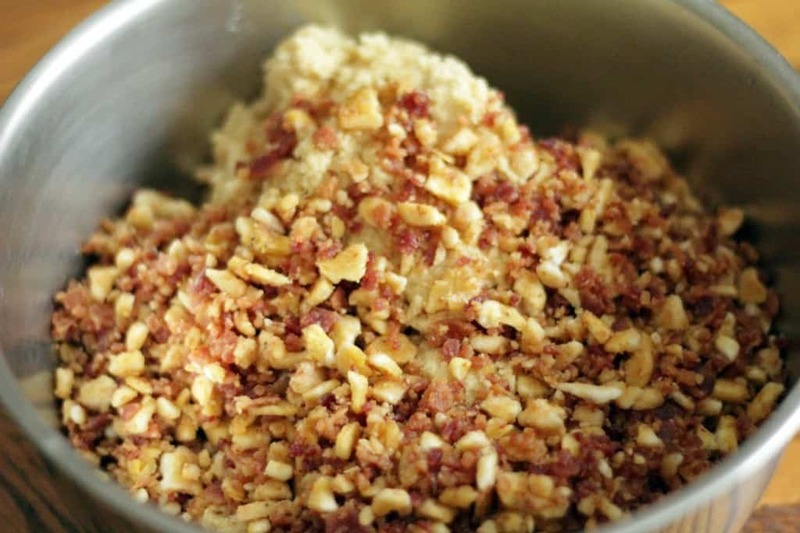 I like to place the bacon and banana chips in a food processor and process for just a few seconds to chop everything. SNAPPY SUBSTITUTIONS: You can substitute any type of chips for the peanut butter chips. I do not suggest substituting margarine for butter, whole eggs for the egg yolks. or bananas for the banana chips. Results will vary a lot the more you substitute. My family will love me for this one!! Oh my – those look scrumptious! I’m adding these to my holiday baking list. How far ahead would u recommend baking these cookies, and how do u store them since they contain bacon. I have them mixed up and dough chilling for a cookie swap. You could make them a few days in advance if you want. I store them in the fridge because I’m overly conservative when it comes to food but not sure if you need to. Do u use light or dark corn syrup in this recipe? Cathy, light syrup, although dark would probably still work. Check out the Pampered Chef mini scoop! It Will be a LOT easier than using a spoon to fill! Sound yummy. can’t wait to try! That’s so awesome! I actually make a cupcake that’s Elvis inspired. How can someone NOT like that combo, it’s just amazing. The cupcake has a banana cupcake base with fluffy peanut butter frosting, drizzled with honey and topped with crumbled bacon. I haven’t blogged the recipe yet, cause it’s kinda like my own little gem of a recipe. Sometimes I do not like banana chips because I find them too hard to bite–do they soften a bit in the cooking process of these cookies? I see that you chop/process them into smaller pieces so I bet that helps too. It just sounds like an interesting and delicious and crazy combo that I may have to try. I chopped the banana chips up very fine so you would never think that they were too hard to bite and they do soften up a bit. They weren’t any harder than a finely ground nut so I think you would find them ok. These look and sound awesome. I’ll bet they’re delicious! Thanks Curt! The cookies are definitely a lot better than they sound! Love the idea of bacon in these! These are intriguing and wonderful. You are killing me. These look WAY better than the burger!